While I’ve had the opportunity to travel a little bit, the truth is there is so much of the world to see, and so many things that are being discovered – daily – that it’s virtually impossibly to explore all of the wonders and beauty our little planet holds. 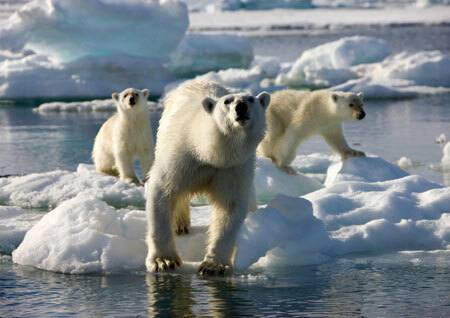 BBC’s Frozen Planet DVD gives the adventure in all of us the opportunity to see, experience, and be thrilled by the majesties and life that resides in our earth’s Polar Regions – the North and South Poles. Narrated by the excellent Sir David Attenborough, BBC’s Frozen Planet is a 3 disc set that contains about 5 hours of amazing scenery and beauty of the regions of the planet few people get to see in “real life.” This wonderful series takes you on a journey that will show you scenes that literally made me exclaim “How did they get that shot?” Fortunately, the “Frozen Planet” Blu-ray and DVD series also includes 60 minutes (6 10-minute featurettes) of behind the scenes footage that give you a glimpse into the extremes that BBC went to to capture these stunning videos. 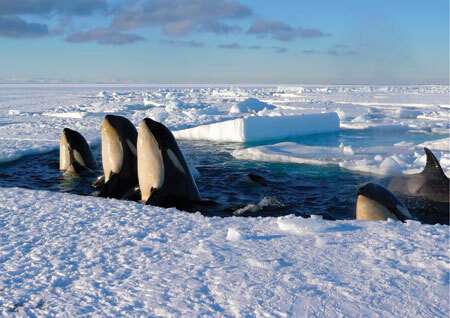 These Killer Whales are checking out the ice. One of the ways BBC always excels is how well David Attenborough narrates the storylines as we follow animals, ice, and nature through the dangerous cycle of winter, spring, summer, and fall in the Arctic and Antarctic regions. When the wolves were hunting for their cubs, I was rooting for them. I felt a surge of joy when the lost seal pup found it’s mother. This isn’t just watching a documentary, it’s discovering new animals, new continents, and new life. A mother polar bear looking hungry, followed by her two cubs. BBC’s Frozen Planet would make a great gift for friends, family, nature-lovers, and explorers-at-heart of any age. 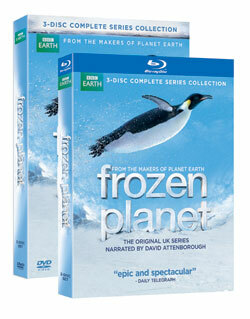 You can buy “Frozen Planet: The Complete Series” on Blu-ray for just $23.99 and on DVD for $19.49. Oh my husband would love this, he’s big on animals, especially documentaries on them. thanks for sharing! 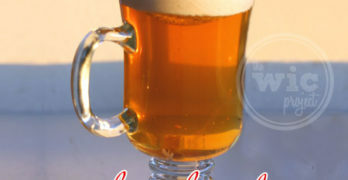 I have quite a few people on my list that would love this, thanks for sharing! That looks like such a fun movie to watch and even one I could get my kids interested in! I’d love this. Thank you! I love watching shows like this. We like nature and animal shows at our house. This DVD would be great to have for the home collection.